CLM100-8-8 Smooth Tapered Column 8" x 96"
High Density Polyurethane or HDP is a very hard foam that feels like wood, but is significantly better. 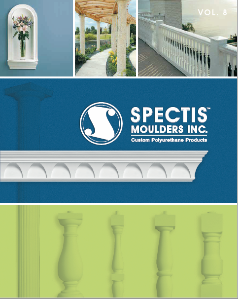 Spectis Moulders polyurethane columns and porch posts are more durable than wood and do not require continuous maintenance or rot repair that wood products demand. Our polyurethane columns easily conceal existing unsightly support posts or pipes already in place: in fact, our Polyurethane line is a great choice for installation around existing supports because we can provide the shaft in two halves, all you have to do is glue them back together using our PLP100 Premium Glue. Add one of our crowns or capitals and bases to further enhance the look. Every column comes primed with a high quality primer and requires a paint finish. All Spectis products are shipped from Canada and are Crated or Boxed very nicely for shipping. Always use PL Premium Adhesive(PLP100) when installing. Are Spectis Columns load bearing? Our Spectis Columns come Hollow or Structural, The Hollow Columns have no structural value and are perfect for wrapping existing posts. Our Structural Columns come with a 4-1/2" Steel Post in the center and have a Max Safe Load of 10,000 pounds. How are Spectis urethane Columns installed? Installation of Spectis Moulding Columns is very easy. Our Columns can be installed the same way wood products are, using nails, glue, or screws. Spectis Columns are made from urethane. What is urethane? Will Spectis Urethane Columns last outdoors? Yes and No. If you have used PLP100 Glue to join columns back together, it will be wise to sand down the exess glue before you finish your columns, Otherwise Spectis columns come factory-primed and ready for finishing. 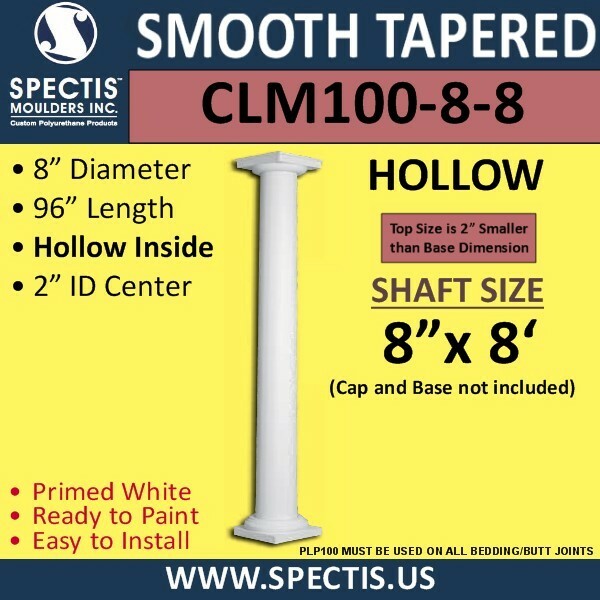 CLM100-10-8 Smooth Tapered Column 10" x 96"
CLM100-12-8 Smooth Tapered Column 12" x 96"
CLM100-14-8 Smooth Tapered Column 14" x 96"
CLM100-16-8 Smooth Tapered Column 16" x 96"
CLM300-8-8 Smooth Straight Column 8" x 96"
CLM300-10-10 Smooth Straight Column 10" x 120"
CLM300-8-10 Smooth Straight Column 8" x 120"